When it comes to turning your backyard into a getaway or retreat, what is the first thing that comes to mind? Is it a private outdoor oasis, complete with water features and an outdoor kitchen? Or is it adding a terraced effect with exotic plants, detailed retaining walls and hardscape patios and walkways that make you feel that you are enjoying the seclusion of a five-star resort? Your home should be your haven, the place where the world stops at the beginning of your driveway and your retreat begins. To add exotic color to your outdoor haven, I have two words; Bird Feeders. You will be intrigued by the various types of birds you can attract to your yard. By attracting these birds, you will add color, sound, wildlife and create a sense of seclusion. There is more to attracting birds than just nailing a birdhouse up to a fence post or hanging one off a tree limb. The species of birds you attract depends on the type of feeder you choose, the placement of the feeder in your yard and the type of feed you put in the feeder. Here are five categories of birds you may want to consider. All come with their own distinct colors, sounds, and traits. 1) Goldfinches: These birds are yellow in color, with the males being more vibrant in the spring season. They are small in stature and shy by nature. You can use everything from Thistle sacks, which are inexpensive and easy to reposition in the yard to small "clinger" only feeders to various types of triple-tube feeders. For the sake of the length of this article, I will give you a resource you can go to and learn more on the various types of feeders. The type of feeder is important to the type of birds you are trying to attract, but even more important is the type of feed you use to draw specific species to your feeders. Goldfinches are partial to finely chopped Sunflower hearts and Nyjer seeds; Nyjer is a black seed cultivated in Africa & Asia and are high in calories and oil content. Another source of nutrition and a strong attraction for Goldfinches occurs in the autumn when the blooms from plants such as Marigolds and Zinnias are long past their pretty stages of summer. These create a great feed for Goldfinches, so be sure to leave these in your garden or yard and you will attract a flurry of activity from the Goldfinches, as they are storing energy for the winter. 2) Cardinals: A regal bird with its pointed crown and vibrant red color trimmed in black mask and neck. If you have ever seen a cardinal up close, you would remember it. It has a look like no other bird, in my humble opinion. Whether against the green of summer leaves or the white of winter's snow, Cardinals are a splendid attraction to any setting. Here is how you can seduce them to your haven. They like feeders either low to the ground or with a platform they can eat from when hung from above. This is due to the fact they are a larger bird and require some space to maneuver. They do not eat from tube feeders, like Goldfinches, unless the tube feeder has a tray on the bottom for them to perch on. Their favorite feed is Sunflower or Safflower seeds; their big bill makes it easy for them to crack these seeds. The addition of a bird bath is another draw for the cardinal, as they love water. 3) Blue Birds: The nesting sites of Bluebirds differ according to your region of the country. For your specific region do a little research and determine the best type of nesting site to build to attract these brilliant blue colored birds to your private retreat. They prefer open spaces so they can feed on insects, their main nutrition source. Another favorite of the Bluebird is live mealworms, so you may want to keep some on hand if this beautiful bird is going to be added to your yards color pallet. For winter nutrition, Bluebirds feast on the berries from Bittersweet & Holly. Again, the addition of a birdbath to provide a water source, especially in winter, will help coax the Bluebird to your backyard paradise. 4) Orioles: An orange bodied bird with black head and back, its wings have traces of white and yellow mixed in amongst black. Orioles are shy birds that migrate to South America for the winters. A great tool in the attraction of Orioles is oranges. Cut a few oranges in half on secure them to a gate or fence top and use them to bait the Orioles into your yard. Another weak spot for Orioles is jelly, they love jelly. You can go to your local bird store and pick up an adapter that fits over the open end of a jelly jar and viola; you have a feeder for the Orioles you hope to draw into your backyard. Due to the fact that Orioles are shy birds, start off by setting the feeders further away from active areas and then slowly move them closer, once you began to gain their confidence. This will give you the pleasure of watching this beautiful bird up close; I guess you can say "You'd have a Bird's Eye view". I know, really bad, but I couldn't resist. Once you notice the Orioles you can leave twine, yarn, and strands of hair for them to find and use in building a pendulum nest they will use for the season. Oranges, jelly, and hosts who do not disturb them, they will love you for the season. 5) Woodpeckers: Last, but not least, in this selection of vibrantly colored and distinctively different birds; Woodpeckers are showy birds with colored plumage. Described as a clinger, because of its ability to grab on with its feet and attach itself to the sides of trees with no or little effort. They have spiny tail feathers, which aides them in climbing and resting on tree trunks. Typically go up and down tree trunks scrounging for insects, it is advisable to hang your feeders for these birds close to the trunk at first, to get their attention. Once you have their attention, you can move the feeder further out on the limb away from the trunk. Tree nuts and peanuts are the secret to luring these birds to your collection of featured wildlife. Beware though, once a Woodpecker begins its assault on the tree of its choice; it could get noisy for some time to come. So there you have it, you have added gold, red, blue, orange and the rhythm of the Woodpecker to your Backyard Getaway. For more information on this subject, I recommend The Backyard Bird Company. Take a minute and Google them, they are jam-packed with great information. For more landscaping and backyard retreat ideas, visit insideoutadditions.com. For all your Home Addition and Landscaping Ideas, please visit http://www.insideoutadditions.com. You will also find a comprehensive gallery of Landscape and Home Addition projects, ideas and designs. Many of which are supplied through the contractor's own portfolio. Many backyard birdwatchers love to watch the Cardinal. It is the state bird of Kentucky and beloved by many. Also known as the 'redbird' it really spices up the scenery with a beautiful bright red color that is offset by its bright yellow beak and black around the eyes. This is the male Cardinal we are talking about. The females have a more brownish color with hints of red. This enables them to blend in with their surroundings while sitting on the nest. The Northern cardinal really stands out against the green and brown backdrops of the summer months. They stand out even more against a fresh sheet of new white snow. They winter within the U.S. and have a tendency to move North to Northeast when during late summer or early fall. They are known for breeding in residential areas as well as in thickets, undergrowth, and dense shrubs. Redbirds are monogamous breeders with eggs that can be in a variety of colors. Some eggs are bluish, some grayish, and some a greenish-white. The eggs are marked with purples, grays, and browns. The chicks will develop from an Altricial state (helpless, blind, and naked). The Cardinal diet consists mainly of insects, seeds, and fruits. It was in the 50's when feeding birds out in the backyard became popular. It has been estimated that the annual expenditure for feeding birds out back in this country is over a half billion dollars. Nearly one out of three households contribute an average of 60 pounds of bird food yearly. This might make it seem as if some species were dependent on us for their existence. While we are able to help in areas of need scientists believe that no species would become extinct if our handouts were to stop tomorrow. They foresee no drop in populations either. Have all been the beneficiaries of range expansions due to human supplemental bird feeding. Some birds like the Mourning Dove have found migrating no longer a necessity with so much food being readily available. The rest of the bunch are still working their way Northward every year. The generosity of backyard bird feeding individuals can sometimes pull a few weak birds through the tough times of winter. After a heavy snow or an ice storm, natural foods can become inaccessible. Bird Watchers will notice their birds increasing their visits to the feeders during harsh winters. Studies have shown certain small birds like chickadees can actually add around 4% more fat when they feed on sunflower seeds rather than their natural diets of berries and conifer seeds. The drawback to the feeding stations is when they attract weakened birds that are carrying disease. Aspergillosis is a potentially deadly infection found in some molds on bread or damp grain. When birds inhale the mold that has been infected with Aspergillus fumigatus it can result in death. The male and female will stretch out their necks. With erect crests, they will begin singing softly and be swaying back and forth from one side to the other. The Cardinal is truly a backyard bird watcher delight. The Red-capped Cardinal is a small bird of the family Thraupidae, unlike other "proper" cardinals of the family Cardinalidae. There also occurs a subspecies of this bird, P. g. nitrogenis, from exists across Trinidad and northern South America. It is frequently found in pairs or family groups. An adult Red-capped Cardinal is approximately 6.5 inches in length and weighs about 22 g. Its head is red and is black around the eyes and lores. Its throat is also black and its legs are a dark hue of gray. The subspecies P. g. nitrogenis is distinguished by its black ear coverts and red lower throat and upper chest. The Red-capped Cardinal's diet is comprised of insects, rice, and fruit. This bird's distribution spans the lowlands of Trinidad and through the northeastern coast and north-central areas of South America (including the Amazon Basin in Brazil. The Red-capped Cardinal has a natural habitat among swamps, mangroves, and other semi-open areas near water. It is also known to inhabit towns and cities. The Red-capped Cardinal breeds from around June to September. A female will lay 2 - 3 eggs but clutch in a shallow nest in a tree or another relatively secure location. The eggs vary in color from whitish to dark splotchy patterns. The Red-capped Cardinal is a little South American bird. This belongs to Paroaria, a genus of red-headed cardinal-tanagers in the family Thraupidae, unlike the cardinals proper that are in the Cardinalidae. They were long thought to be closer to American sparrows and put into the Emberizidae. Red-capped Cardinal = Florida's Exotic Wildlife. Species in fine detail. Unfamiliar Established status: Species had been formerly present in Florida, but are no longer present. Risks to natives: Species Accounts: Native to South America. It also is a very common species on the llanos of Venezuela. This particular bird was bathing inside a shallow pool at Hato El Cedral, Apure, Venezuela, in April 1992. It feeds on insects, grain and fruit. It is usually present in conspicuous pairs or loved one's groups. It is known to type from June to September, and possibly earlier and/or later. The actual Red-capped Cardinal builds a short cup nest, some 9-10 cm wide and 7 cm high outside with a Seven cm wide by Four cm deep cup, inside a tree or some other safety spot. A nest in the Cuyabeno Faunistic Reserve (Ecuador) had been built in the roots of the Macrolobium sp. This article will give you all there is know about how to attract the most beautiful feathered friends in North America into your own garden, which is a difficult feat as they usually stay hidden most of the time. 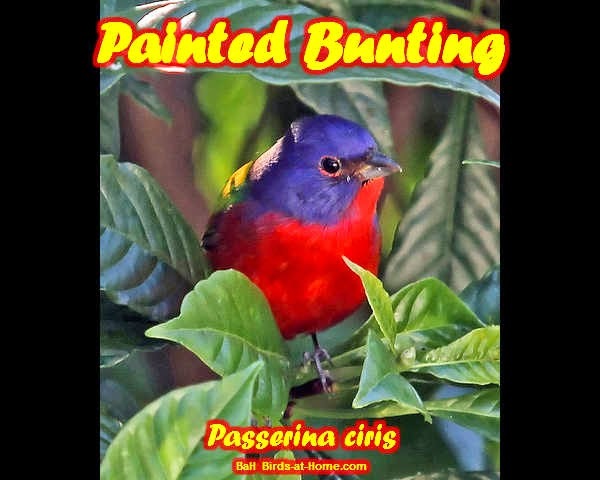 Getting to Know Your Bird.The Painted Bunting (Passerina ciris) is a species of bird belonging to the Cardinal (Cardinalidae) family. It is so named because of its beautiful and brightly colored hues of dark blue head, green back, as well as red rump and underparts. Boons of Attracting Birds.Because of their seemingly painted colors, they were once highly captured and caged such that they are shy and secretive. Even when they sing they remain in hiding and can be very difficult to spot because of their shy nature as well as their ability to camouflage the surroundings especially the females and juveniles. Being able to attract them into your yard and garden gives you the chance of witnessing these feathered beauties for yourself. Laws of Attraction for the Painted Bunting. 1) Make your environment welcome the birds. Landscape your gardens in such a way that will be suitable as a mating and nesting ground for the Painted Bunting and other bird species. Place several plant species of trees and bushes, which will give the birds a feel of their natural habitat of woodland and brushy, insuburban, and garden areas. You can ask from your local field guide for plants which are endemic in your area. 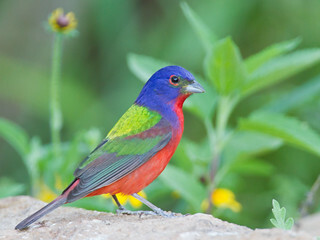 It would also do you some good to research on specific plants which the Painted Bunting prefer and naturally thrive in. It is also important to keep any cause of disturbance away. For instance, if you have kids, make sure to situate their playground as far possible from your landscaped area. In addition, have nesting areas for the birds distanced as far from the trees and bushes to prevent attack from predators. Nesting areas need also to contain adequate ventilation and, again, a mechanism to protect from predators. 2) Provide for their needs. Just like any animal, offering the Painted Bunting with unlimited supply of food and water, most especially, will keep them within the confines of your yard. Because the birds are largely seed eaters, you can have a variety of seeds and add syrup and suet to the mix. To efficiently contain the food items, you can get any of the bird feeders which afford them with much privacy as possible when eating. You also need to provide a water source, and bird baths can help you do this. For both food and water, it is integral to keep them fresh to ensure consumption of the birds, thus, remaining in your area. If you successfully achieve the feat of attracting the Painted Bunting in your garden and make them stay a long time to witness their mating and nesting habits, you can expect them to return in the succeeding months and years as they have found a niche in your garden or yard.